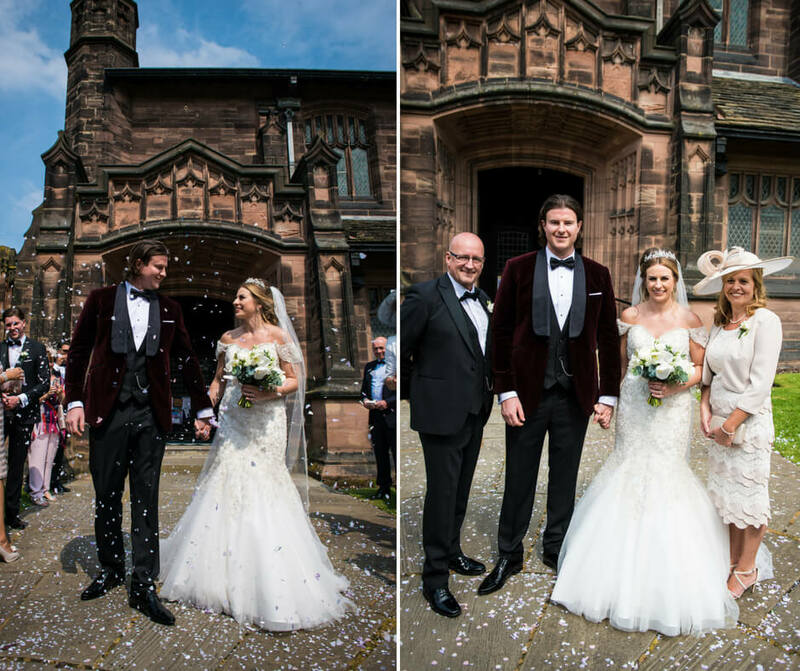 Ben’s wedding suit was inspired by Hollywood star Benedict Cumberbatch. Read on to find out how we re-created his red-carpet look. 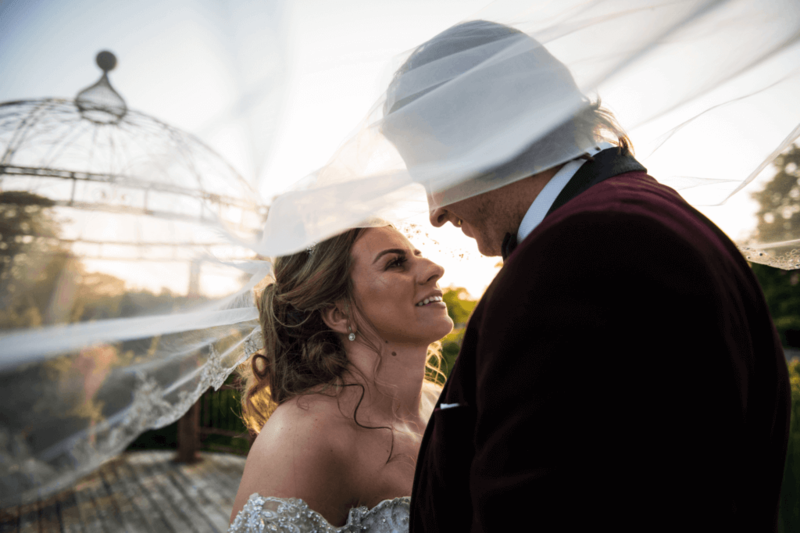 We first met Ben and Lauren back in June 2017, when Ben approached us with a clear vision of what he wanted to wear for their wedding. 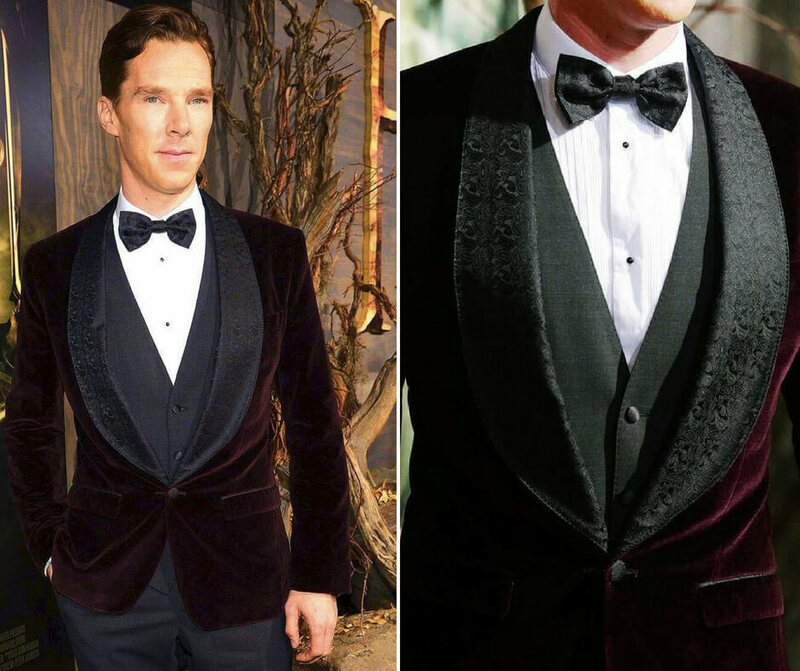 As a huge fan of The Hobbit, Ben got his inspiration from Benedict Cumberbatch who wore a burgundy velvet dinner suit to the premiere of the 2015 film. Working with Ben to re-create his dream suit gave us a real sense of enjoyment and our first task was finding the perfect fabric! Like Benedict Cumberbatch, Ben wanted a plush, burgundy velvet and chose a cloth from Holland & Sherry’s luxurious, black tie collection. We then added a black satin shawl lapel, with a beautiful jacquard design which really gave it the wow factor. For the trousers, Ben went a little more understated, opting for a matte black twill to compliment the rich burgundy. He finished his look with a black satin waistcoat in a classic, low-cut design to reveal his studded Marcella shirt. At 6ft 5’’ with an athletic build, Ben had always found it difficult to buy off-the-peg suits. 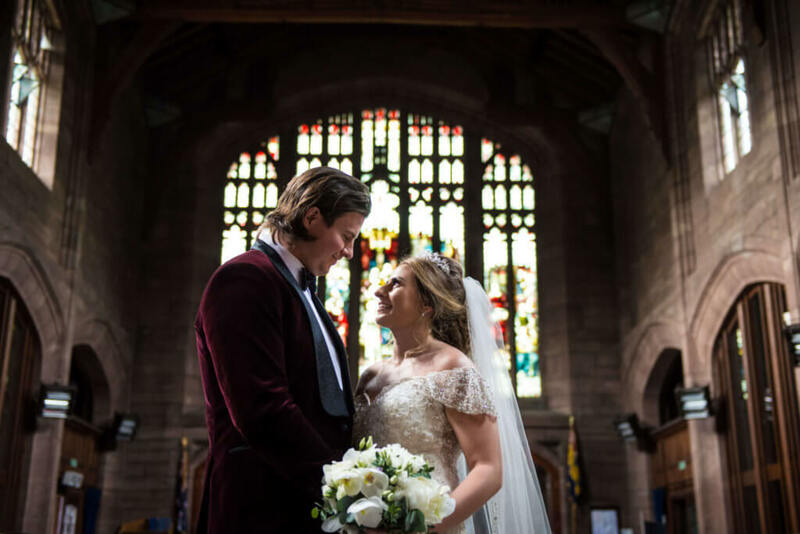 For us, it was simply a matter of designing a bespoke suit with the right proportions to fit and flatter his frame. 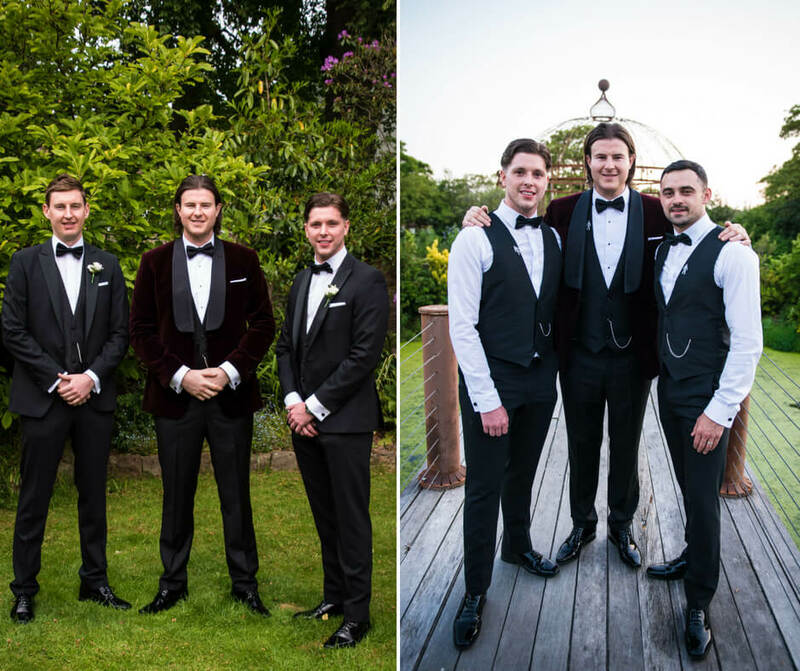 To compliment Ben’s long torso, we designed his suit jacket and waistcoat with a lower opening and gave his jacket slightly wider lapels to create balance between his upper and lower body. 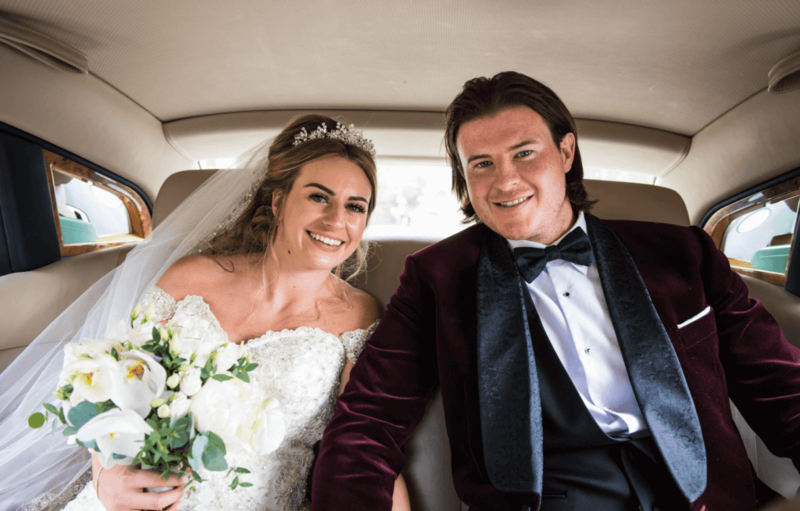 With Ben’s broad shoulders, it was also important to ensure he didn’t look top heavy, so his trousers were designed to fit around the seat and thigh, with a slim cut below the knee. 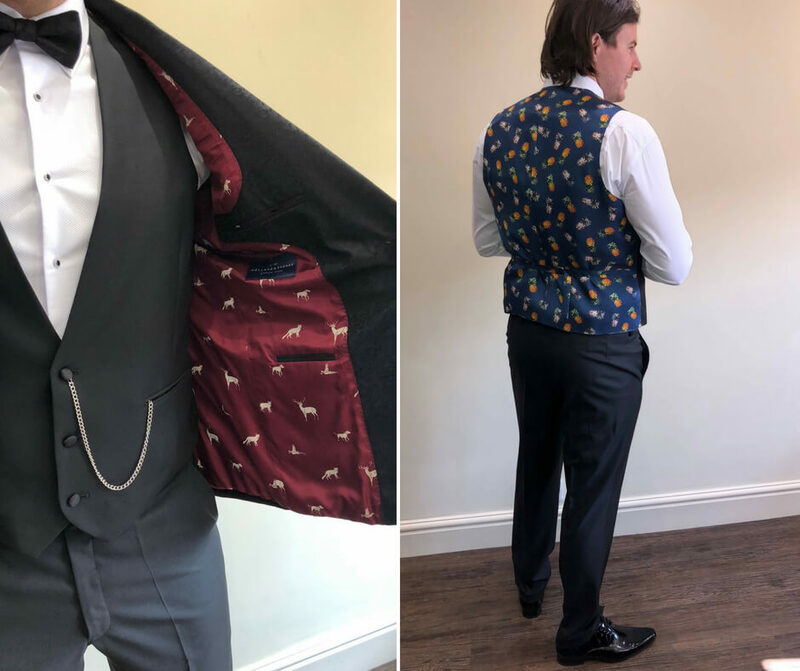 Although Ben wanted to replicate Benedict’s red-carpet look, he added his own personal twist, lining his waistcoat in a crazy, pineapple print that reflected his fun personality. For his jacket, Ben went a little more modest, choosing a burgundy cloth with a heritage stag design. He finished his look with a black jacquard bow tie, fob watch and black patent shoes. 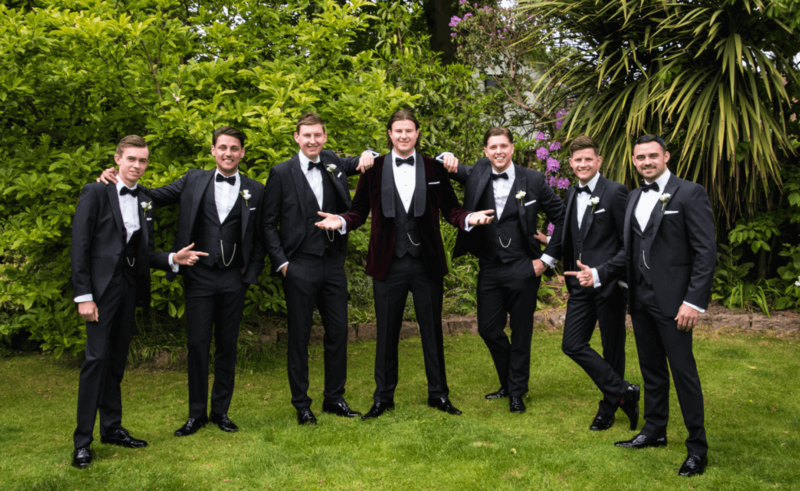 To compliment, his groomsmen wore the Dorchester dinner suit from our hire suit range. 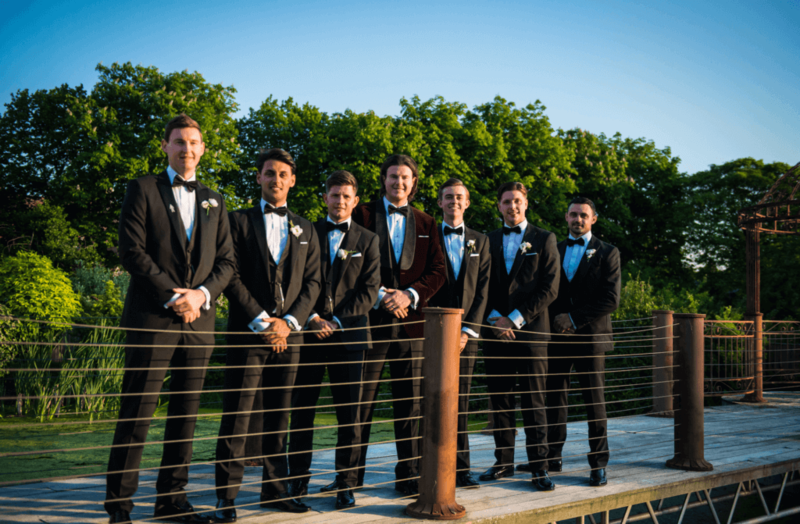 If you would like to enquire about our made-to-measure or suit hire services for you and your groomsmen, get in touch by calling us on 01625 536 545.